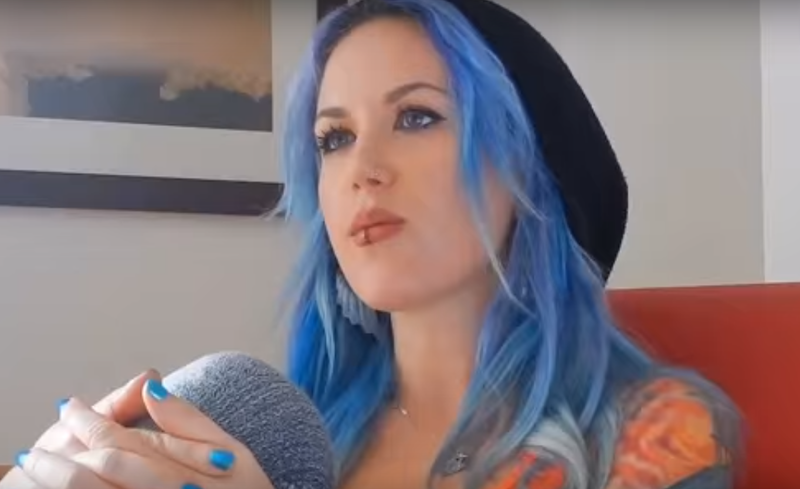 Arch Enemy singer Alissa White-Gluz was recently interviewed by Eyescream All Access, you can read some excerpts below. About if it was strange replacing a singer as "iconic" as Angela Gossow, Alissa said: "Actually, no. I think it's the only way I would wanna replace someone, actually, because she was my friend for a long time, so I already know her. And I wouldn't want to just — like a lot of other bands have done — just join a band against the will of the previous singer or just step into something I had nothing to do with. This was a band that I was already friends with, I knew all of their songs already, because I was a big fan of the band. And it was Angela's decision to stop singing and it was also her decision to invite me in in her place. And it was also her decision to say, 'I'm not even gonna write anymore. You take it over. It's your band now.' You know, just give me full reins of the position of lead vocalist for Arch Enemy. So I feel more comfortable knowing that she's also happy with this. So it's actually a good situation." About joining a band like Arch Enemy that has been around for so long already: "It's pretty cool, actually, to see how that band… how they work together musically, how they work together on tour, in the writing process. It's very cool. I feel very happy to be now a part of this family, because… I've already worked with Kamelot, obviously, where you have Thomas [Youngblood, guitar], who's been doing it forever and has had many of the core members for a long time. There's a certain professionalism that comes with bands that have been doing it for that long that I really, really appreciate. So they made me feel very welcome. I didn't feel like the 'new guy' for very long. And then Jeff [Loomis, guitar] came in, and now he's the new guy, so… [Laughs]"
About Arch Enemy's split with guitarist Nick Cordle and addition of Jeff Loomis: "I really love Nick Cordle. I think he's an amazing guitar player and a friend of mine; I still talk to him. But, obviously, in bands, there's so much that goes on other than just writing songs and playing shows. Touring, it's really difficult to actually make a band work, and I think that's why there's so few bands that do work, actually, 'cause there's so much that goes into it. So I wasn't expecting the change of Nick into Jeff, but I'm really happy. Jeff is super nice, a super-cool guy, and an amazing guitar player. I feel a really good chemistry on stage with him. I can see the chemistry between him and Michael [Amott, guitar] is amazing. And, obviously, you really want that, especially when you have a guitar-intensive band like Arch Enemy, you want both guitarists to really play off each other like that, so I'm really happy to have Jeff in the band." About if she misses singing "clean," like she was able to do in The Agonist: "Yeah, I mean, I love singing clean also, which is one of the reasons I wanted to continue with my old bands and stuff like that, and it's one of the reasons that I am continuing with Kamelot. Because that gives me… It's almost like a theater, where I can play a character in every song, 'cause Kamelot songs are very… There's always a narrative going on, there's a story within albums and in songs, so I get to play a character and sing it in a different way than people might recognize coming from me. Of course, I scream in it too. You know, I think in Arch Enemy, there's a couple of songs from 'War Eternal', actually, that I made demos with clean singing, just because I was, like, 'Okay, I know it's not the norm, but I think this sounds really good.' And then Sharlee [D'Angelo, bass] was, like, 'Wow! That is really good,' or Michael was, like, 'I really like this.' But, you know, we have to think of what's the best sound overall for the band. And so in the end, we decided… I think on the album, there's, like, three or four songs where there actually is some clean singing, on 'War Eternal', but you have to listen very, very closely to hear it. Like on the chorus of 'Avalanche', for example, I'm actually singing that [laughs], but I'm singing it with a lot of rasp. And, you know, in the future, if some songs seem like they would sound good with clean singing, I'm sure we would all be open to doing it. I mean, there's some songs on previous albums from Arch Enemy that had clean vocals, but it's not Angela singing; it's a guest. But I think it would be cool. It's just a matter of writing the best song. I'm sure that Daniel [Erlandsson, drummer], for example, could play amazing flamenco beats on the drums, but that doesn't mean that he has to put that in an Arch Enemy song, just because he can do it. So it's the same thing here. If it's appropriate for the song, I'll do it. And if not, then I'll just continue to do clean singing with Kamelot. And I have a bunch of guest vocals. I do guest vocals all the time. So I still have outlets for that, if people wanna hear that."